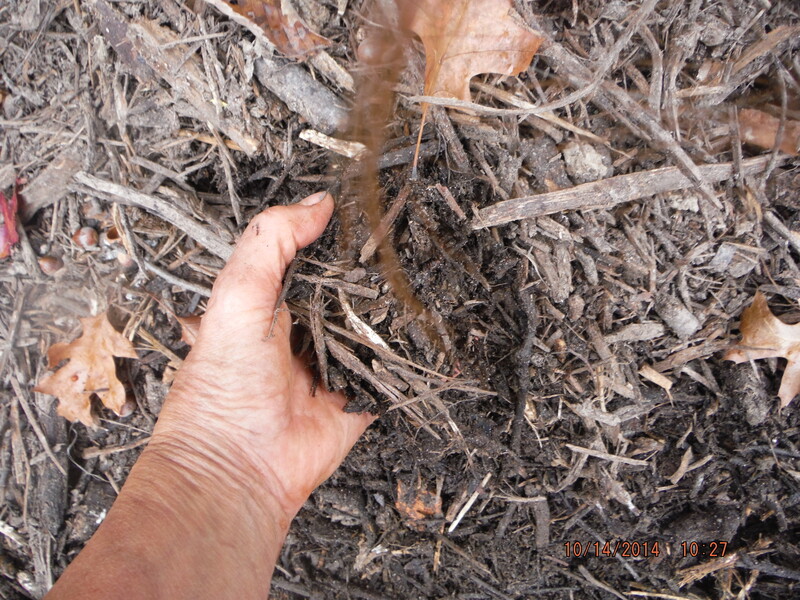 Compost Furnace ~ what are the next steps? 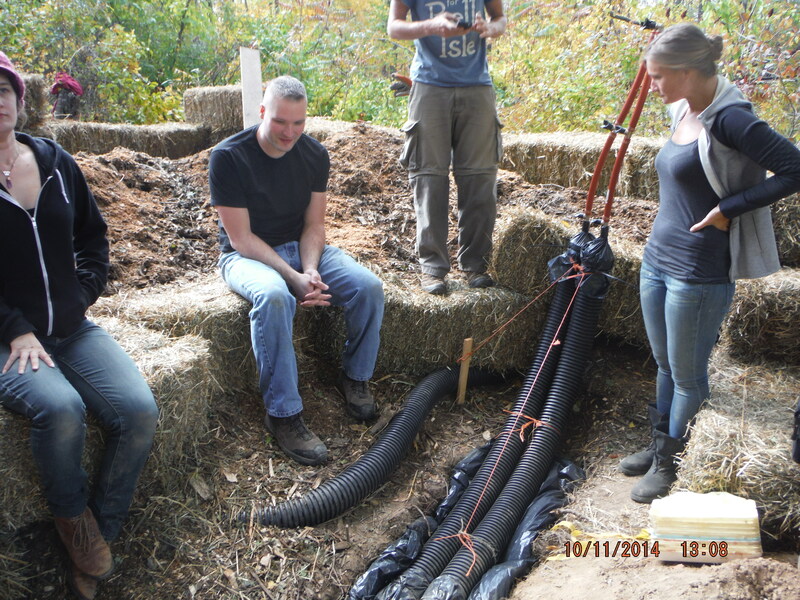 1) 1″ pipe in to the Strawbale Studio 2) thermostat in the line, 3) drain valve, 4) shut off valve and expansion tank, 5) fill value 6) a manifold or T and L’s taking the the 1″ line to two 1/2″ loops of unequal length (lower 190′) (upper 300′). I think there should be some sort of flow restriction valves on each loop to adjust flow/temp through the unequal loops if necessary . 7) pex loops go through the floor then 8)have an inline thermometer on each loop before going 9) back to a manifold that takes the two 1/2″ pex loops back to one 1″ pipe, 10) followed by a shut off valve, then 11) the pump and 12) another shut off value, then the 1″ diameter “cold return” pex pipe exits the Strawbale Studio to circulate water through the Compost Pile. 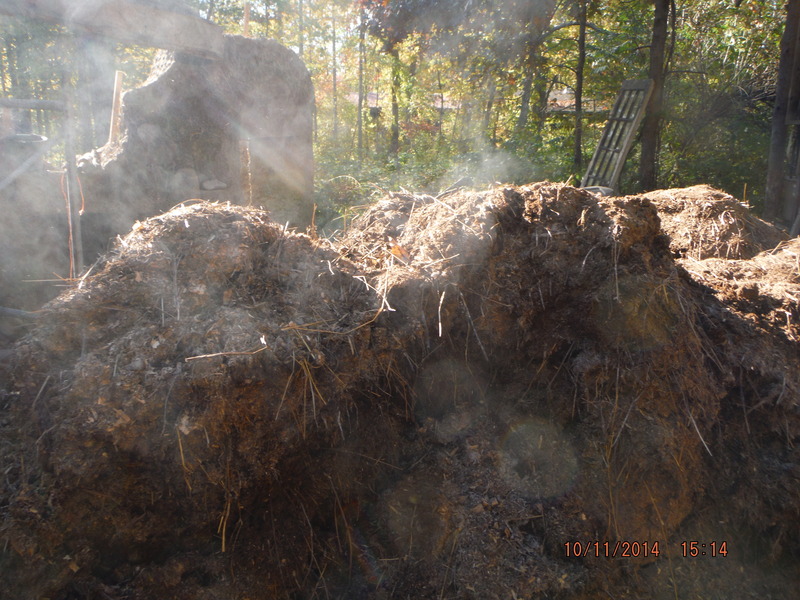 The Compost Furnace pile is COMPLETE ! 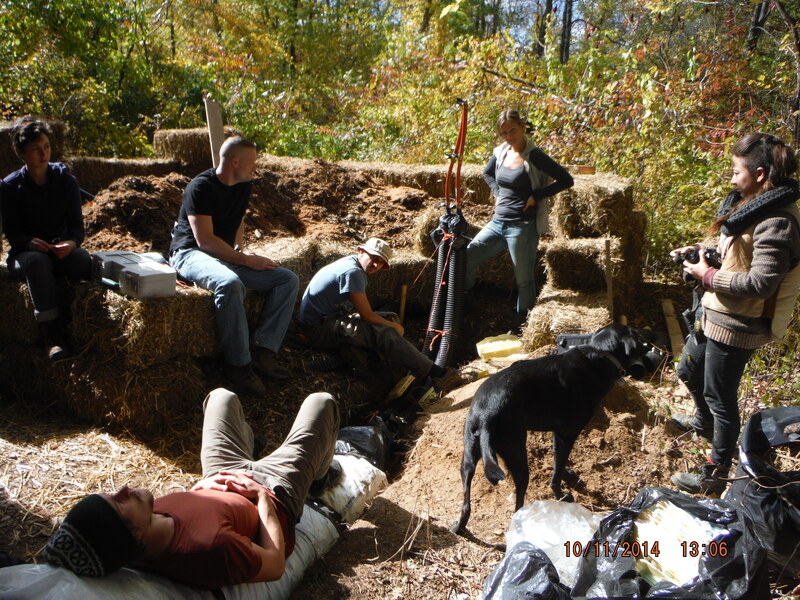 Jen, Michael and Deanne bring the pile to completion ! 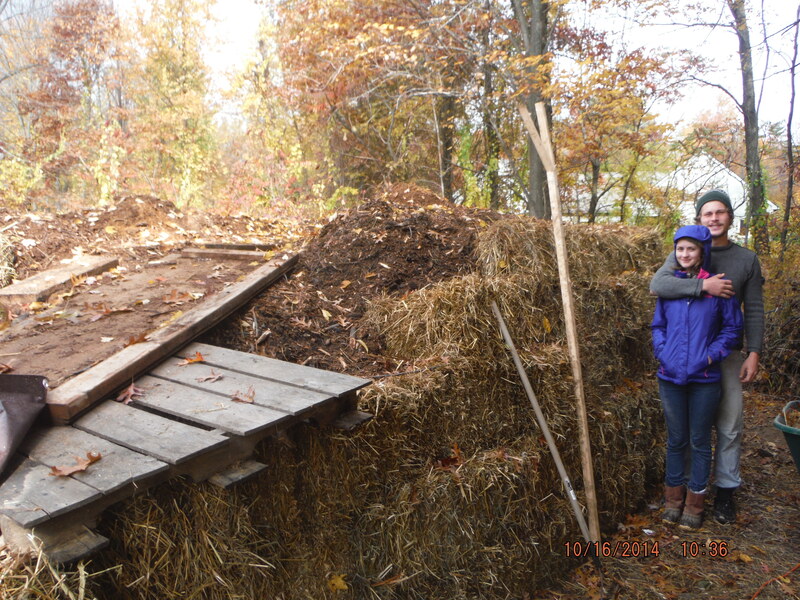 The last hay bales of the COMPOST FURNACE pile are in place, the ramp is gone,and the pile is now covered with loose hay as a cap. 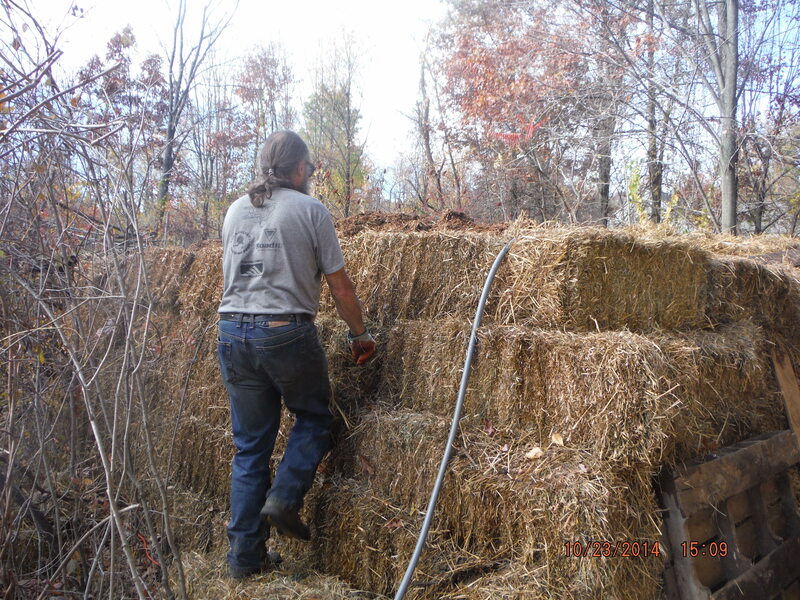 Hay donated by Wez Igon, wood chips through Jason Kendell & Father & Son Landscaping, sawdust donated by Nelson Wood Products, Lapeer, MI. 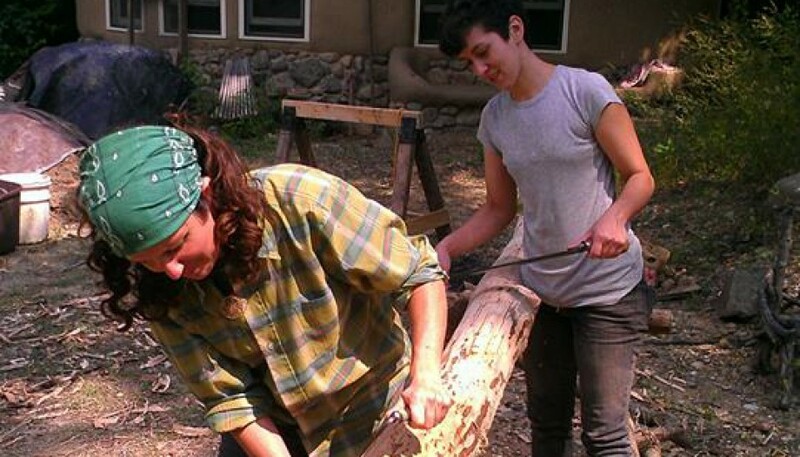 Thanks all who contributed time and energy, vehicles, tools & more ! 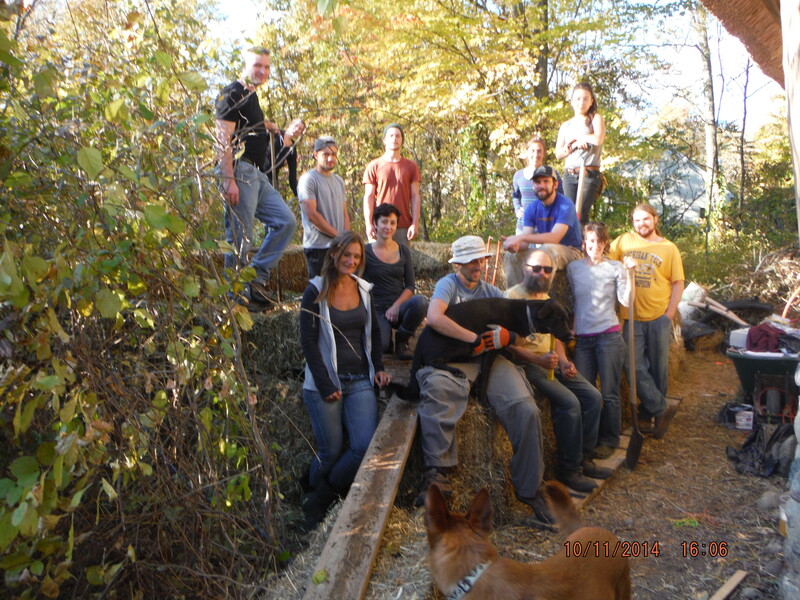 The ramp is taken down, the last bales in place, and the top capped with a foot of loose hay ! 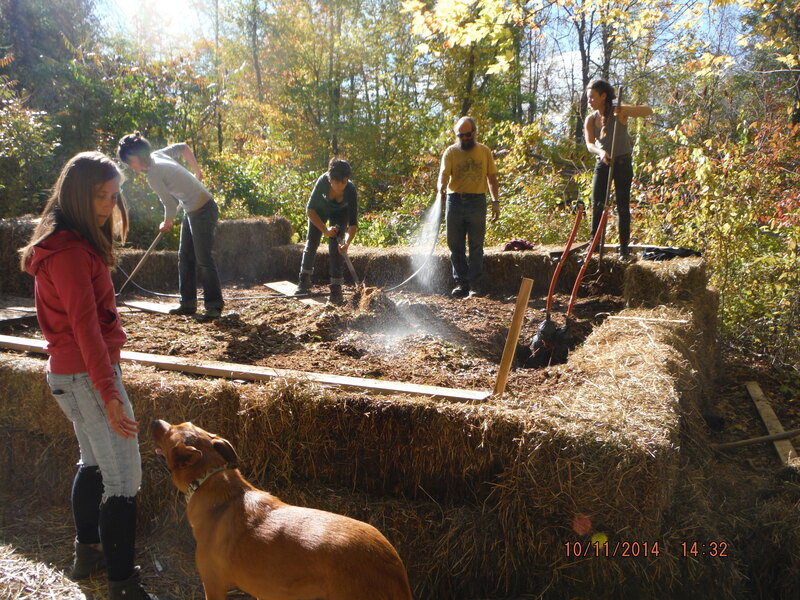 Next step, purchase and install the pump and monitoring equipment, fill with water and propyl glycol to keep from freezing, and start pumping the water heated by the compost pile through the pex tubes in the floor and benches of the Strawbale Studio ! The there will be a Celebration Party November 15 to …..celebrate ! RSVP from the Calendar page of this website. Experiments ! 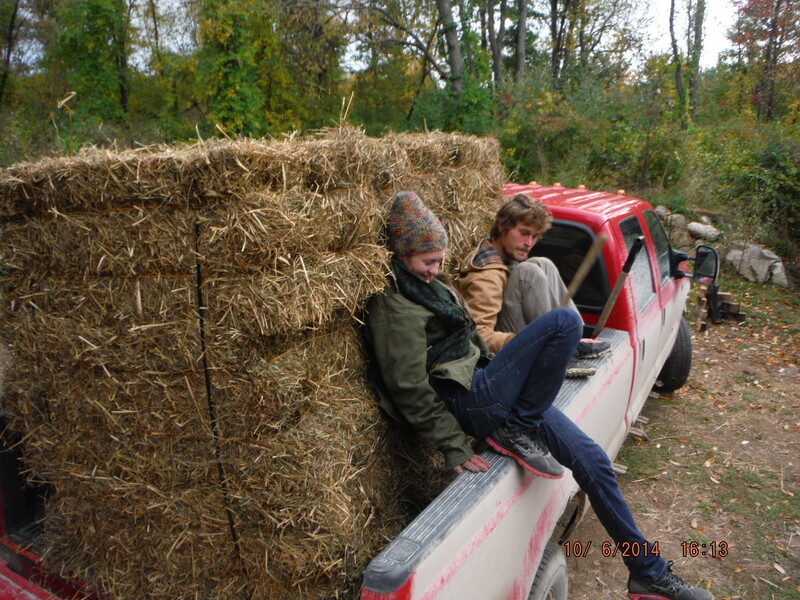 Can Shihaiya and Thomas flip the 21 bales off Dave & Dorindas truck without clipping the straps and separating the bales. The answer is …….. NOPE. But it was a really good try. Going back and forth to Almont to get 21 bales at a time was a lot of shuttling, but the scenery along the way was great. We stopped the car at one beautiful place and Thomas climbed up a big old Oak tree. That was one of the best moments. Getting work done, and also being spontaneous. The sun was shining, and the trees growing together over the road making a tunnel of enclosure. So how was it, working with 1″ pex tubes? 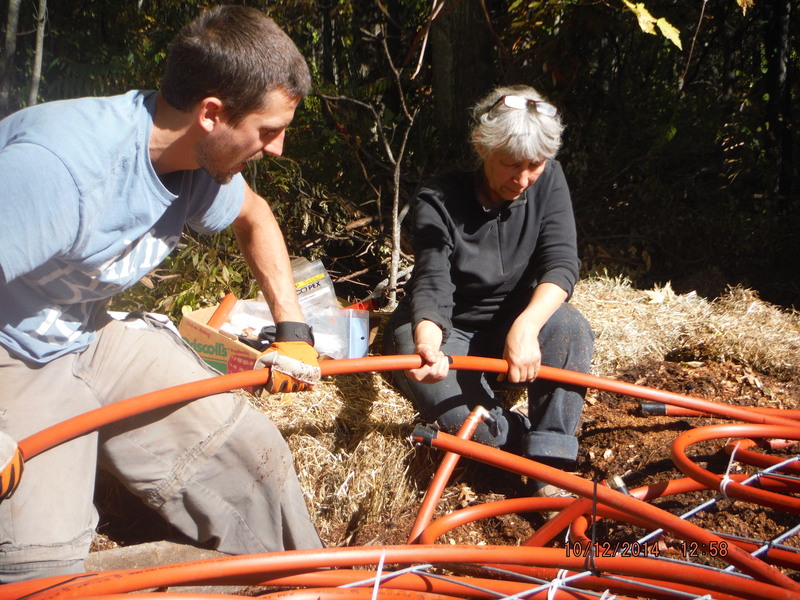 Well ….really challenging because the temperature was cool, they weren’t bending easily, and somehow we were supposed to get 150′ of these pipes attached to a 4×12′ piece of cattle fence. It was pretty much a left brain physics problem combined with wrestling an alligator. 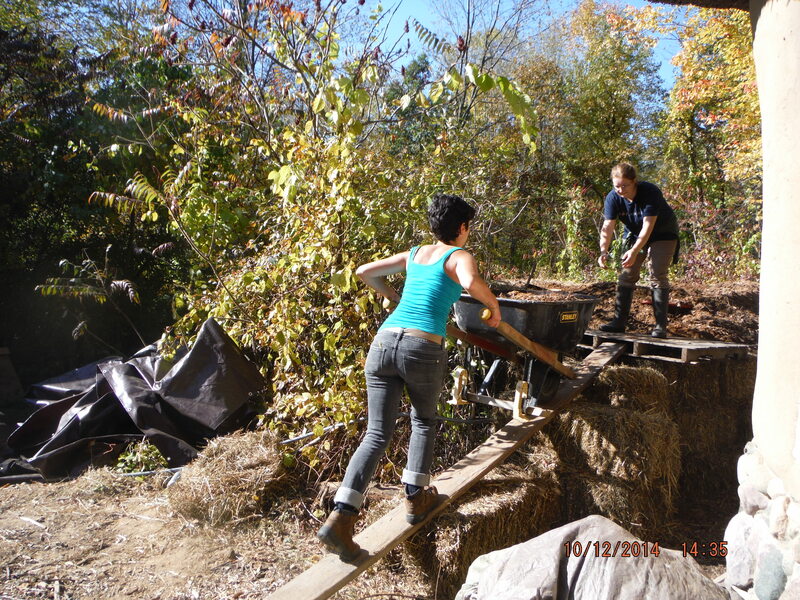 Thomas and Shihaiya led the way, figuring out a good path for it all, while using up all 150 feet, and having the beginning and end of the pipe end up where it needs to be for attachment to other pipes. Sometimes we watch and reflect . . . 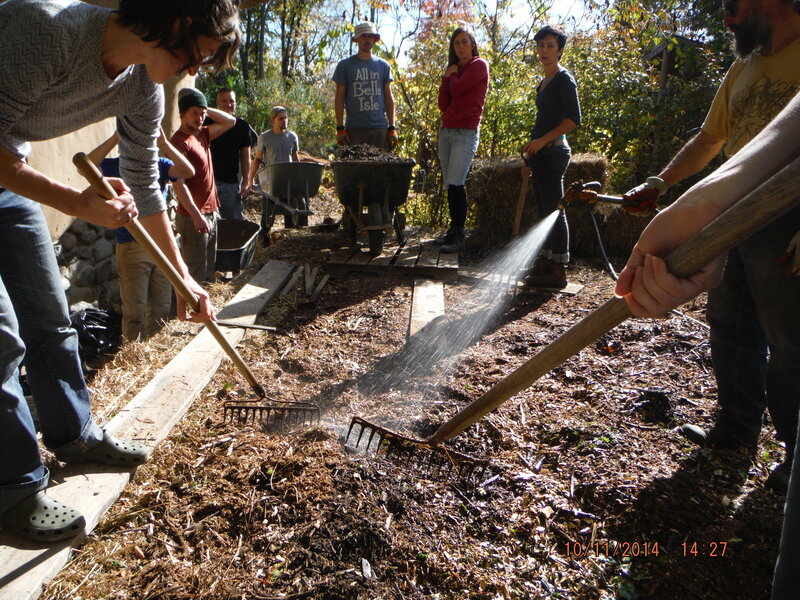 The Compost Volunteer Gang Saturday October 11, 2014. 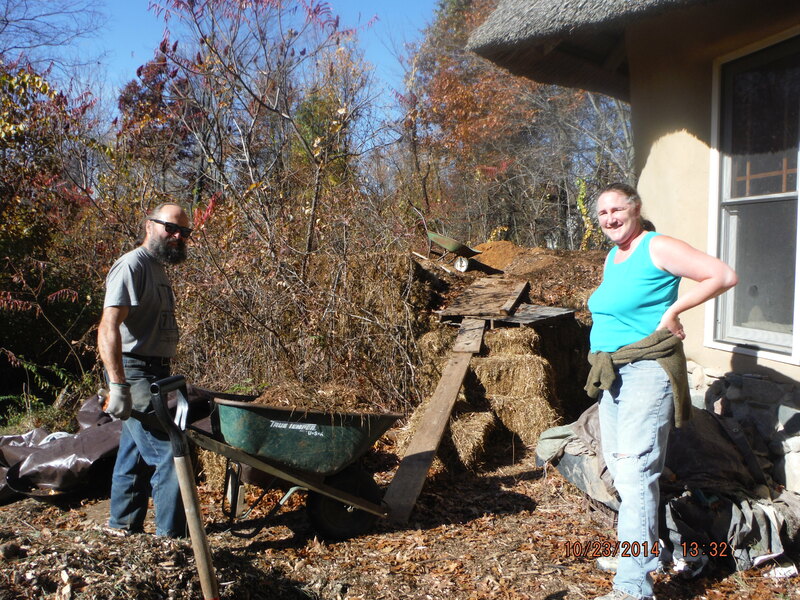 Volunteers are needed Wednesday October 15, 2014 10a- 4p to complete the Compost pile construction that will heat the Strawbale Studio. 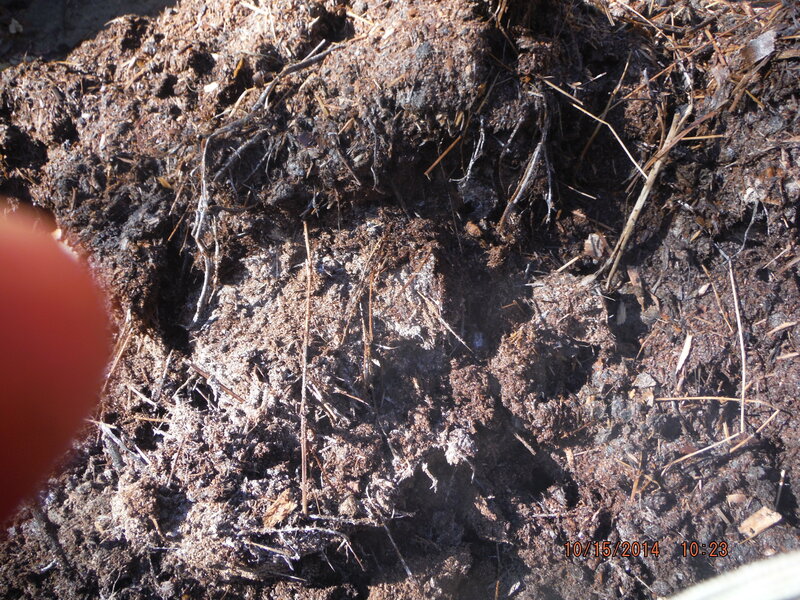 So far there is a 15×20 ft. pile of biomass about 5ft high, with pipes running in three levels inside the pile. 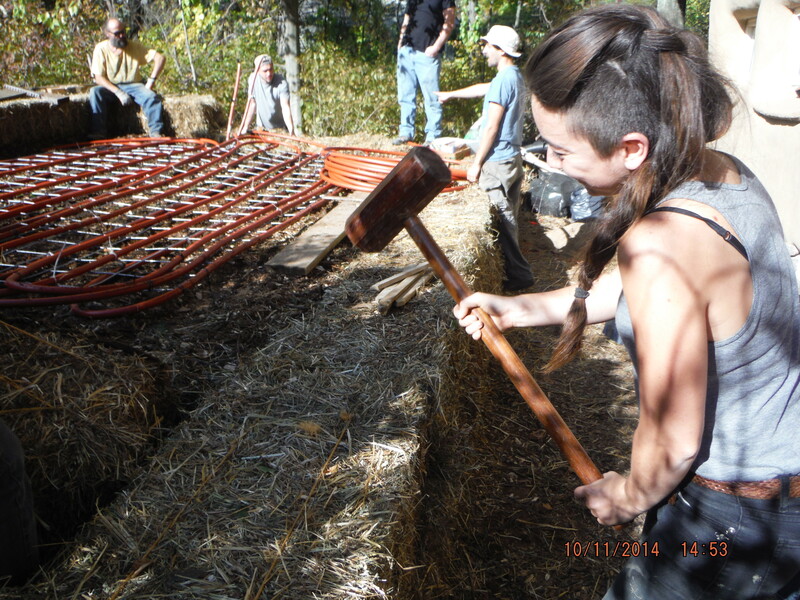 The pipes will connect to the radiant floor in the Strawbale Studio and heat the floor and benches with the warmth of decomposition in the pile. A pump will circulate this closed loop. 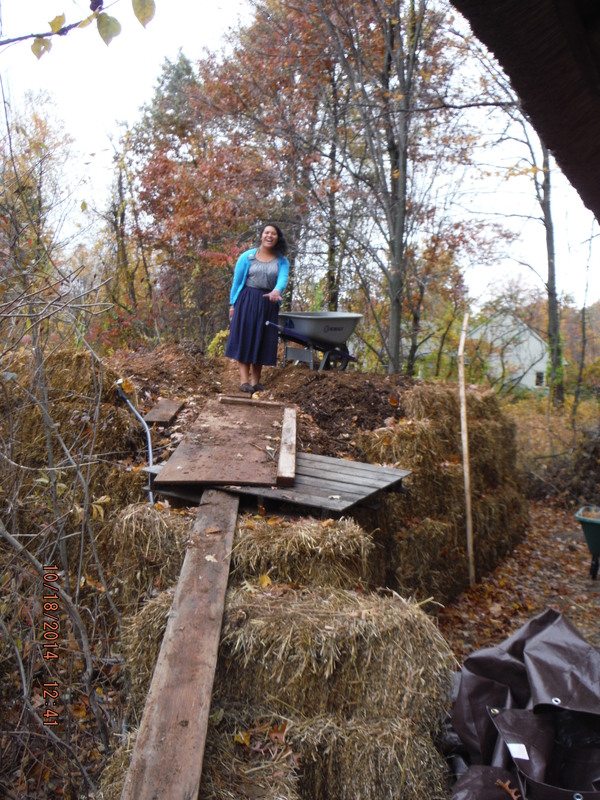 the Compost Pile is bounded by 4 layers of strawbale, and tomorrow we will finish adding the last 2 feet of compost (sawdust, woodchips and such) on top, then capping it all with 12″ of hay to keep in the hot. 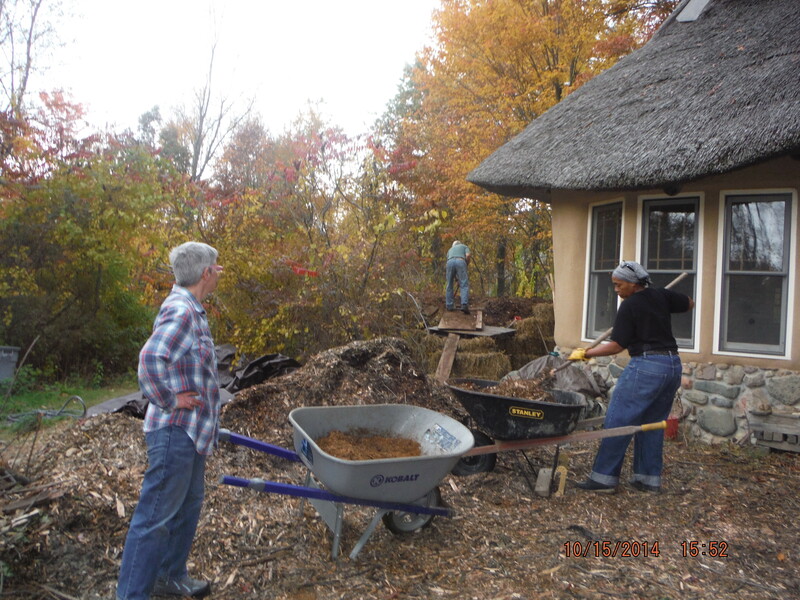 October 8 – 12 were our construction dates, and we “almost” reached our goal ~ only 2 feet of compost to go, plus a loose straw cap of 12″ . Come help us complete it. RSVP to Deanne 248 496 4088. 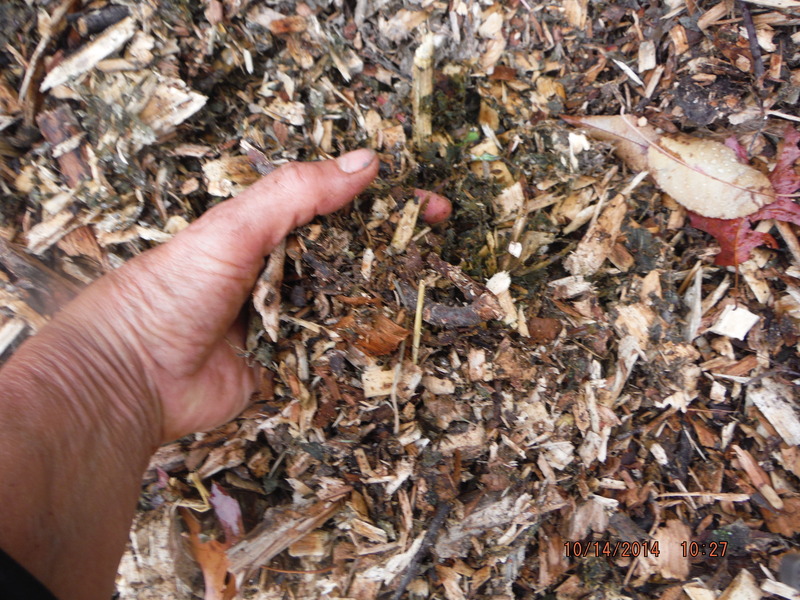 Watering the Feedstock (biomass) in the Compost Heater. 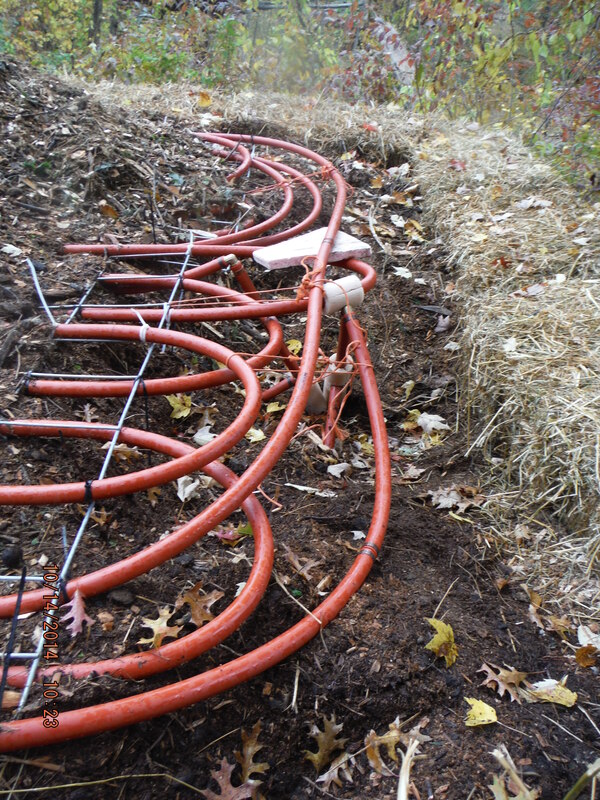 Pex pipes attached to cattle fencing is added at 3 different levels of the pile. Strawbales being persuaded into place. 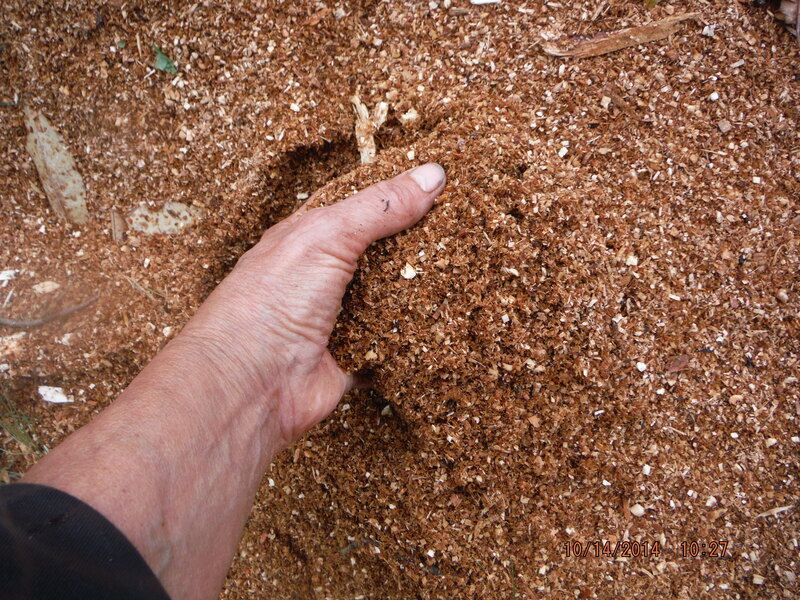 Moving the materials up into the Compost Furnace.